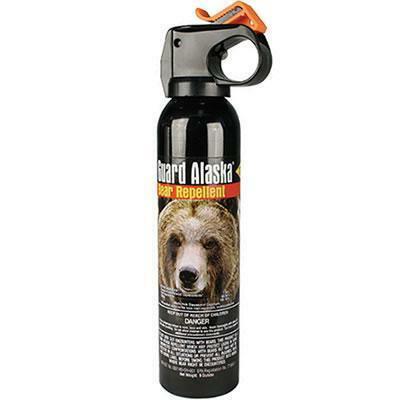 Guard Alaska® Bearspray Guard Alaska ultra hot pepper spray has proven so effective repelling bears, it is the only one registered with the EPA as a repellent for All Species of bear! It is absolutely the most effective and powerful bear defense spray available today. It is environmentally safe! Does not contain flammable or ozone depleting substances. NOTICE: THIS PRODUCT IS NOT ELIGIBLE FOR FREE SHIPPING OR ANY SHIPPING DISCOUNTS..DUE TO STATE LAWS, WE CANNOT SHIP THIS ITEM TO ADDRESSES IN THE STATES OF HI, WI, NY, OR MA. DUE TO CUSTOMS REGULATIONS, THIS ITEM CANNOT BE EXPORTED OUTSIDE OF THE UNITED STATES. ADDITIONALLY, THIS ITEM CAN ONLY BE SHIPPED VIA UPS GROUND.